Tubulointerstitial nephritis and uveitis (TINU) is a rare syndrome in which idiopathic interstitial nephritis coexists with chronic recurrent uveitis. This syndrome often represents systemic disorders such as arthralgia, rash, prolonged fever, anaemia and ocular symptoms that require medication including glucocorticoid administration. 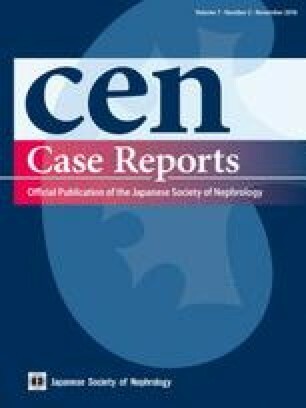 Recently, novel urinary biomarkers, such as kidney injury molecule-1, neutrophil gelatinase-associated lipocalin and liver-type fatty acid-binding protein, were shown to be associated with tubulointerstitial damage and were elevated in interstitial nephritis. We evaluated these urinary biomarkers in a case of TINU syndrome before and during treatment and found that their levels were elevated at onset and decreased during treatment, especially NGAL. We conclude that these urinary biomarkers are useful to evaluate and predict prognosis in interstitial nephritis. Informed consent was obtained from all individual participants including in this case report.